Inception is set in an unspecified time in the future where technology has advanced to the stage where a group of trained experts are able to enter the human mind through dream invasion. The word “inception” refers to the action of invading and manipulating a person’s subconscious for personal gain, specifically for industrial/political information. The film opens with Cobb (Leonardo Di Caprio) and his colleague Arthur (Joseph Gordon-Levitt) who are attempting to manipulate a powerful man named Saito (Ken Watanabe – from The Last Samuari). When their plan fails, Saito offers Cobb a deal that he cannot refuse – a chance to return to America to be with his children – if he completes an ‘inception’ on an industrialist named Robert Fischer (Cillian Murphy of The Dark Knight). This task requires three levels of dream invasion – a dream within a dream within a dream. This seemingly complex narrative is intertwined with Cobb’s own personal issues concerning his deceased wife Mall (Marion Cotillard) who haunts his thoughts and dreams, which creates many problems for the task at hand. The acting is top-notch from everyone involved: Leonardo Di Caprio is convincing as always, and the supporting cast including Joseph Gordon-Levitt and Marion Cotillard are captivating, and Michael Caine also makes a very brief appearance. I’m a fan of Christopher Nolan – who previously brought us the re-envisioned Batman franchise and the psychological thrillers The Prestige and Memento – and this film, with its high production values will certainly please most viewers. 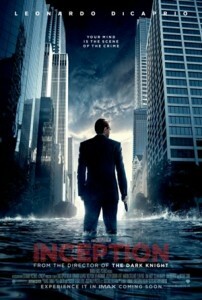 Despite the inclusion of some fairly irrelevant scenes, such as the extended action sequence set in the snow, which is reminiscent of a scene from a Bond movie, Inception maintains interest. Overall, this sci fi/mystery blockbuster will keep viewers entertained and at the edge of their seats for the majority of the film – with the final shot providing a memorable twist. I wouldn’t say it is set in a time in the future. I think the insinuation is that the technology is available now. I thought Ellen Page was amazing in this movie.